Reception Clarion Hotel in Trondheim. Norway Convention Bureau (NCB) is part of Visit Norway and promotes Norway as an international meetings destination. We can help you find the right venue for your event in Norway. NCB acts as a central point of contact for event organisers who are interested in Norway. We provide neutral advice and can put you in contact with the best suppliers for your needs, thus helping you to make the right decisions for your event. As the official representatives of the international meetings industry in Norway, NCB is experienced at dealing with all requests professionally and promptly, right down to the smallest detail. With a broad portfolio of established partners across the conference sector, NCB can guarantee a successful meeting. Norway has a wide selection of high-quality hotels, as well as excellent event facilities - the perfect destination to unwind from the hectic everyday routines back home. NCB is always happy to provide a first-hand introduction to all that Norway has to offer. NCB acts as an umbrella body for the Norwegian conference industry. NCB is affiliated with ICCA (International Congress and Convention Association) and UIA (Union of International Associations). Meeting with a view in Oslo. Kayaking in the Lofoten Islands. Local convention bureaus provide free advice to help you plan your event in Norway and put you in contact with the best suppliers in your chosen area. The capital of Norway is a well-equipped conference city with a cosy and easily navigated city centre. There are meeting facilities for up to 6,000 people and over 12,000 hotel rooms with a total of 20,000 beds on offer. The gateway to the fjords. A World Heritage City. A European City of Culture. And an international meeting destination with facilities for up to 2,200 delegates. 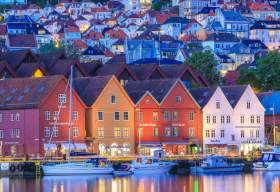 Easily accessible from Europe, Trondheim is a city of education and research. Trondheim Spektrum can arrange conferences for up to 3,000 delegates. Stavanger and Sandnes have over 200,00 inhabitants and can offer around 10,000 conference chairs. The region is close to the extraordinary cliff the Pulpit Rock. Norway's longest fjord, the largest glacier and the highest mountains – Sognefjord offers the most spectacular scenery for meetings and events. In addition to 8 hotels and conference capacity for 1,000 delegates, Ålesund boasts one of Europe’s most distinctive collection of Art Nouveau buildings. Hurtigruten's 13 ships have modern meeting rooms and conference facilities, so you can take your team on an inspiring journey along the coast of Norway. Bodø has 7 conference hotels with a capacity of up to 1,000 delegates. Compact in size and close to nature, you can combine your meeting with nature-based adventures. The professional network Arctic meetings can help you arrange a conference, incentive trip or event in Tromsø, Harstad and Svalbard. XXLofoten specialises in the planning, organisation and execution of meetings, incentives, congresses, conferences and events in the Lofoten Islands. Norway Convention Bureau and their partners can help you to find the right venue for your event in Norway. Norway Convention Bureau's hotel partners cover the whole country, offering conference facilities at all of its destinations. Download a video or presentation visualising Norway as a conference destination in images.